It was a good weekend here. The kind that gets you excited that summer vacation is so close. This is Asher's last week of school. I am looking forward to having my 3 little chicks home with me again. I plan on wearing them out at the pool every day so they are too tired to get on each others nerves. Think it'll work? I had a couple of hours to myself on Friday. Obviously I went to Target. Grabbed myself a popcorn combo of course. Anyone else put parmesan on their popcorn? Also, anyone else find themselves putting a ton of things in their cart they don't fully intend on buying, only to unload it all in a random end cap? No? Yes? I needed some more of my ELF concealer and it was toward the bottom of the display. So I knelt down on one knee to grab it. I felt something cold but thought the floor was just cold. Then I realized it was water. Then I looked down and realized I was *this close* to crushing the biggest, grossest black water bug I've ever seen. I mean *this close. * I am certain it would have made a crunching noise and I am certain I would have fainted. What in the world was a huge black water bug doing on the makeup aisle of my happy place?! You didn't see the bug. You would have too. 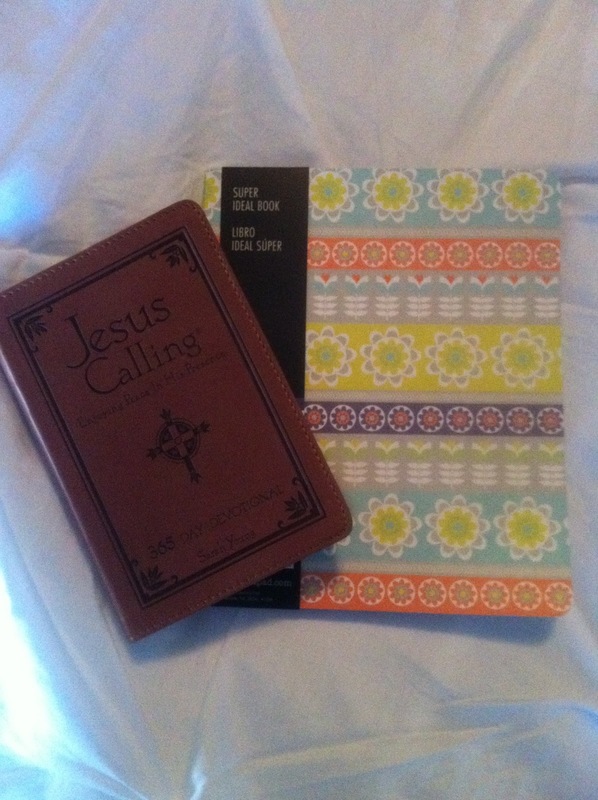 Also got myself the "Jesus Calling" devotional by Sarah Young, that I've been wanting for a while. I need a bit of a kick in the booty to get me going in the morning for my quiet time. Finally made it to the bookstore to grab it and it was on sale for 50% off! Only 10$ for the leather version. I was going with the intentions of settling for the paper back. Love when things like that happen don't you? If you've wanted this devotional book also and you have a Family Christian Bookstore, GO get yourself one QUICK cause the sale ends Tuesday! Saturday, I decided to try to enjoy the sun in our backyard... Only to find myself dodging water balloons from a war going on between Asher and B. And getting soaked by a 4 yr old little girl who accidentally turned the hose on as high as it could go then tried to control it but couldn't and ended up spraying me instead. Twice. My tanning lotion still had sand in it from the last time I used it. Which was in Hawaii. Which was so not the same as the scene going down in my backyard. We also had an impromptu neighborhood movie night Friday. I love that our kids have so many friends on our little street. I love this sweet season we are in as a family. It's a good one. You know how you can just feel it? So how was your weekend? Hope it was good! Time for a new week! 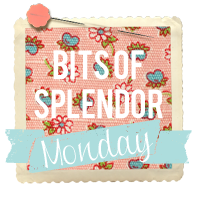 How did you find a little bit of splendor in your week? Link it up and share it with us. uh, yeah, or i just hand the cashier a huge pile and tell them i changed my mind. i'm sure they love me. I LUH-UVE Jesus Calling... So excited for you to start it. Prepare yourself for a life change :-) Blessings! hahah i love everything here!! and YES ive done that at Target too!! gah...love that store. thought I might be on the look out for bugs now. :) haha. Also, love yalls movie night...how fun is that!? love you friend!!! I have been looking at getting the Jesus Calling devotional too. I actually almost bought it at Costco the other day - wasn't that nice leather version though - so I am glad I waited! We have one that I do with the kids each morning. You should check it out! Love how it is at their level and it's written as if Jesus is writing to them each morning. How fun! You guys played the movie on the side of the house?!? Love that!! Ooh that book is on my wish list. I am going to have to go and see if it is on sale here. I love the cheese for the popcorn... I do the same thing with the popcorn and the end caps. I call it "cart edit" time. I'm new to your blog, and just wanted to say hi! Can't wait to read more! I am with you on the pool thing....every single day! Love your post this week:) Summer is here and it looks like you guys are ready to soak it up! It sounds like you had a wonderful weekend! We are so ready for my son to be done with school so we can officially enjoy summer! By the way, I am with you on spending too much at Target...and yes, we put parm on popcorn! target end caps... glad i am not the only one! movie night outside looks so wonderful. my boys have two weeks left of school, and yes i plan on wearing them out everyday. my 13 year old has agreed to go running with me while my 11 year old is at math camp. woot! nothing like a child hold you accountable. ha! a bug in the happy place...NOOOO!!! Love the movie on the side of the house! So fun!! I'm checking out that devotional! I, too, need something to get my booty in gear. And yes, we will be at the pool EVERY SINGLE DAY this summer. Wear them out! Great idea! OMG the story about the water bug. My heart start to race just reading that. A couple of years ago I was pulling on a pair of shorts that had been sitting on the floor and then something scurried down my leg. I look down and it's a HUGE water bug! I kid you not I burst into tears and had a full on panic attack. My hubby thankfully was right there to kill, but I'm still traumatized from the experience. Your weekend sounds like it was wonderful! (Besides the water bug incident) Hope this coming week is just as wonderful! Ha! I'm a "end cap" shopper too! It helps to weed out the must haves from the "love but too pricey to buy"'s. I am SO looking forward to summertime, it's a few weeks away and we will be camping and running to the river like nobody's business! Mothers Day Giveaway from the Splendor Shop!